The first images that come to mind when you hear the word “Viking” are barbaric marauders who terrorized the coasts of Northern Europe. But did you know that there are more to these people than what’s usually depicted? Vikings gave the world Alþingi also known as the world’s first parliamentary government. Aside from being politically savvy, Vikings were also agriculturists. They travelled the world for trade and exploration. They had knowledge of the stars, mathematics and had their own calendar. For sure Vikings were fierce warriors but they also imparted their trade and technological advancements to the world. Vikings play a big role in Northern European history and it’s for this reason that their culture needs to be celebrated. One of the best ways to do this is by wearing Viking themed jewelry and gear from Odin’s Glory. You can choose different types of jewelry from their wide array of collections. They have necklaces, bracelets, rings and accessories that can be bought online through Odins-Glory.com. All their designs pay homage to the rich Viking Culture. Odin’s Glory is a small family business that prides themselves of selling only the best handmade Viking themed jewelry. 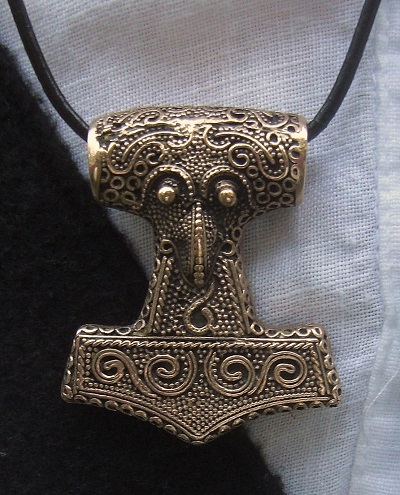 Some of their best sellers include handmade Viking King Chain with dragon head and Mjolnir pendant. It is made with high quality stainless steel that won’t tarnish or rust. Another great find from Odin’s Glory is their Handmade Stainless Steel Viking Warrior Ring. It features some of the most iconic Celtic symbols used in ancient times. The ring symbolizes the strong bond between gods and men. It is made from 100% stainless steel and comes with a leather pouch. Odin’s Glory is also a great place to find other Viking products such as weapons. They have a good collection of hand forged axes and even Thor’s hammer. You can also find hair and beard products like hair bands, beads and pins as well as beard oils. Odins-Glory.com also sells key chains and mugs. Owning Viking-themed jewelry and gear is also a great way to celebrate Viking countries like Iceland and Norway. These countries are known for their extreme weather conditions as well as Viking Lore and history. They are also hard to visit especially during the winter season which is why having Viking themed gear and jewelry is like having a piece of history with you at all times. Products from Odin’s Glory is delicately crafted and intricately tooled just like Viking art that was found in archeological sites around the world. Check out Odins-Glory.com for the best Viking gear on the web.